What's bright blue, heavier than water and mostly insoluble? In the case of a brownfield site in the Midwest, the answer is a daunting remediation challenge. It's no secret that dense non-aqueous phase liquids (DNAPLs) defy many traditional remediation techniques. The mere fact that the chemicals do not readily dissolve in water makes standard flush-and-pump techniques inadequate. Consider that these chemicals, upon release, soak directly into the soil and often scatter in every conceivable downward direction. If they enter a retention pond, they sink to the bottom, commingling with sediment or continuing to flow downward. When a release enters a site's groundwater, cleanup can become complicated, leaving site owners and those charged with cleanup operations singing the blues. A dye manufacturer operated on a 7.5-acre site in Ohio until the late 1990s. After the operation closed, testing revealed a substantial release of trichlorobenzene (TCB), a non-reactive solvent used primarily as a dye carrier. In this case, the normally colorless TCB was already mixed with a dye and was easily identified on the property by its bright blue color. As a DNAPL, TCB is heavier than water, but during times of heavy rainfall, the creek that flowed through the property ran blue. The problem was easy to identify but challenging to solve. For obvious environmental reasons, the owner needed to take action, but it was also an important business decision. An engineering firm was appointed to design and manage site cleanup operations. The initial plan called for determining the extent of the contamination and exactly what needed to be done to bring the levels into compliance and return the property to economic viability. A limited remediation system had been installed on the inactive site, but it did not adequately prevent material from escaping with groundwater flow. The system operated a series of isolated pumping wells that extracted the free product and water and transported it to an aboveground treatment system. With groundwater TCB concentrations reading as high as 60 milligrams per liter (mg/L) or 60 parts per million (ppm), it was clear the current system was not working -- or was working much too slowly. The approach needed to take the entire affected area into consideration. The system underperformed because each well did not carry a large-enough area of influence. 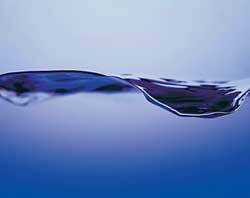 TCBs are typically sluggish to flow horizontally, except in times of heavy groundwater flow. When sites use this technique, the broad expanse of soil and water between each pumping well is largely neglected and the product remains highly concentrated. In 2000 and 2001, the engineering and environmental contracting team designed an improved system that addressed the discharge problem and provided more consistent coverage for removing product from the affected area. Cases likes these are typically not appropriate for in-situ treatment, particularly when concentrations are too high to employ a surfactant or any oxygen or hydrogen releasing compounds. Doing so would mean introducing even more compounds to the site, creating a possible residual chemical problem. Sites such as these often benefit from a much more natural approach. The new plan called for the installation of a bentonite slurry wall along the perimeter of the property to contain the groundwater and TCB, as well as a narrow interception trench to run inside the perimeter of the slurry wall to extract water and product. The environmental contractor conducted a constructability review before the job was initiated and modified the plan to include the installation of geotextile fabric and pea gravel for the interception trench. The sequence of construction played a key role in the project's success. It was important to install the interception trench before sealing off the property. The system needed to have the means of dealing with the water flow in place before it created a water pressure backup. The narrow interception trench -- 2 feet wide by approximately 25 feet deep -- ran 380 feet in length around the affected area. The bottom of the trench was keyed into the underlying lacustrine unit at a minimum of 4 feet. The team used the Geotextile fabric, pea gravel, and naturally occurring guar gum as a slurry to keep the trench open, and they equipped the trench with five extracting wells and piezometers to measure water level and pressure. Unlike the previous system, the trench encourages and efficiently manages the flow of groundwater and product, and it pumps the mixture to the aboveground treatment system. As soon as the interception trench was in place, the crew immediately constructed the perimeter slurry wall, effectively preventing future off-site release of TCB. On smaller sites, such as in this example, space is a major consideration. Trenches need to be narrow enough to fit and just wide enough to perform the job they are designed to do. They also have to be spaced far enough apart to prevent them from collapsing together. After collecting in the interception trench, the water and material is pumped aboveground to a treatment system that sends it through a series of tanks where gravity allows the solvent to separate from the water. The flow is routed through a bag filter unit to remove particulates, then through an activated-carbon treatment system to remove the solubilized solvent. The system ultimately adjusts the pH level and discharges the water into the public sewer system. During periods of heavy water flow, the system allows for 58,000 gallons of supplemental groundwater storage and containment in five on-site tanks. Overall, while this natural approach to remediation takes a longer time to accomplish the initial goals -- in comparison to in-situ treatments -- it is an effective method of removing a stubborn DNAPL and, most importantly, preventing further release of the contaminant to surrounding properties. To date, the system continues to work on cleaning the site and free product is still present; however, the contamination levels have been cut in half, with the highest concentrations reading about 30 mg/L. The final remedial action objective (RAO) for TCB at the site has not been specified by the U.S. Environmental Protection Agency, but the proposed RAO cites an ultimate concentration of 0.175 mg/L, based on discharge of groundwater to surface water.